Maria von Trapp and Mozart are Salzburg’s most famous exports. In 2015, 50 years after it first came to the screen, The Sound of Music continues to resonate with film lovers. It’s the third-most successful film in history, after Gone With the Wind and Star Wars. 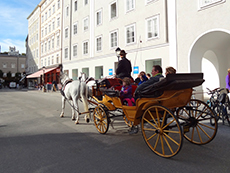 Today in Salzburg, Austria, where the movie was filmed, more than 300,000 tourists a year visit the city and the surrounding countryside to tour the movie’s filming sites. 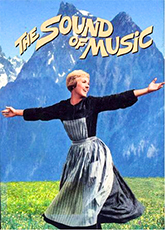 In fact, 70% of overseas visitors say The Sound of Music was their primary reason for traveling to the city. In Salzburg today the only sound you hear more than “Do-Re-Mi” is ka-ching, ka-ching. Salzburg is a storybook city complete with domes and spires set below an imposing fortress, all surrounded by a backdrop of mountains, a scene you never tire of. There’s also enough art, wonderful Baroque and modern architecture, great food and superb festivals to make your head spin. Everywhere you look the city oozes charm and beauty. If you visit head first for the Altstadt, the city’s Old Town and a UNESCO World Heritage Site, where horses clip-clop through the streets pulling their carriages to Residenz Platz, the most famous plaza in the city. Go to Getrapidegasse, a picturesque street with tall narrow houses and plenty of shoppers. There you’ll find the home that was Mozart’s birthplace. 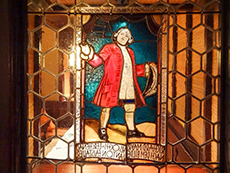 Climb up the stairs and you’ll find memorabilia from the virtuoso, including the violin he played as a child and the clavichord on which he composed several different works including the Magic Flute. Continue to the top floor where there’s an intriguing exhibit called “Mozart Online” that shows you the notes being played. Venture beyond Getrapidegasse and you’ll be well rewarded since many of the alleyways that surround Mozart’s birthplace once housed craftsmen and artisans who in the 13th century worked there in the open courtyards. Delve into its maze of streets and you’ll find these courtyards now brim with little cafés and shops. Ask for directions to the nearby ornate Café Mozart and relax over a morning cup of coffee. 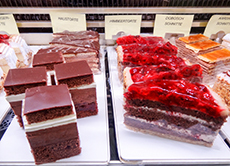 Or go to Schatz-Konditorei, the oldest pastry shop in the city (also not far away) and linger over decadent pastry. If it’s lunchtime you may want to visit the popular and cozy little Triangel Restaurant behind the University Church. 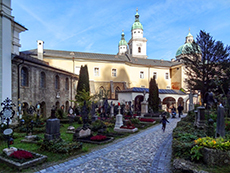 It’s adjacent to the festival halls of the famous Salzburg Festival and during the Salzburg Festival you’ll find festival patrons in suits and gowns sharing Triangel’s outdoor lunch tables with diners in shorts and t-shirts. Since the area is so compact you’ll find the restaurant St. Peter Stiftskeller isn’t far away. Claiming to be the oldest restaurant in Central Europe, if not the entire continent, it was first mentioned in writings in 803. Located in (but not associated with) a still-functioning monastery, the restaurant is quite deceiving. Enter and you’ll find one small room to the left and another across a little courtyard to the right. But when you go up the stairs you’ll stumble into a labyrinth of private dining rooms that culminates in an ornate, chandeliered room at the end. In this room the restaurant hosts its Mozart Dinners, three-course affairs prepared with traditional 18th-century recipes. They’re served during the intermissions of candle-lit performances of some of Mozart´s most popular compositions performed by musicians and opera singers in period costumes. 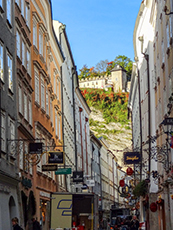 For a city its size, Salzburg hosts an incredible number of cultural events, some 4,000 in all, and the wealth of the city’s historic art, architecture and culture is incomparable. Topping the list is the acclaimed Salzburg Festival founded in 1920. Today it continues to be a huge draw with numerous events as diverse as the venues in which they are held. The high point in the city’s cultural calendar, the festival’s myriad performances include concerts, theater and opera. This year’s dates are July 18-August 30, 2015. The Salzburg Festival is preceded by sommerszene, an international avant-garde dance festival that spans a two-week period. This year the festival will take place June 24th-July 4, 2015. As might be expected, the city also boasts some great museums including the Salzburg Foundations Walk of Modern Art (10 outdoor sculpture projects by famous international artists); the Museum der Moderne (a permanent collection focusing primarily on European artists); the Baroque Princely Residence (16th-19th-century European paintings); the Museum of Modern Art (located on top of Mönchsberg, with a great view of the Old City) and Hangar-7 at the airport (a masterpiece of avant-garde design and home to a fleet of historic aircraft). While running about don’t overlook the city’s more “pedestrian” experiences. 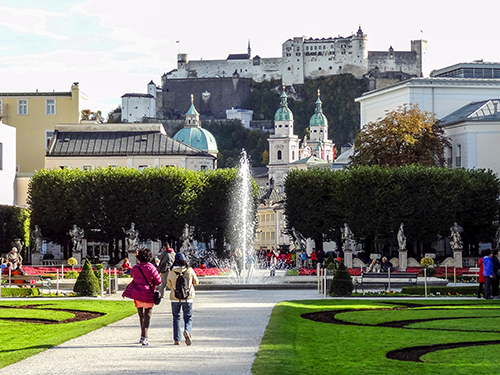 Leave time to visit Mirabell Palace and Gardens for a great view across the Old Town to the Hohensalzburg Fortress and the Salzburg Cathedral (Dom), the most visited attraction in the city. You’ll see its two towers jutting up as you look across the river from Mirabell. Don’t miss a trip to Residenz Platz and a visit to the palatial Residenz to view the artistic treasures contained in the huge residence of the former Prince-Archbishops of the city. From there you’re only a few minutes from the funicular that will take you up to Hohensalzburg Fortress for a great view of the city and surrounding area. If you’re a Sound of Music devotee you’ll likely want tor visit the places where the movie was filmed. Among the most popular venues are the Mirabell Gardens in which you’ll find the Pegasus Fountain and hedge arcade where Maria and the children danced and sang “Do-Re-Mi”. Another is Residenz Platz where Maria crossed on her way to the von Trapp Villa from Nonnberg Abbey, which is about a 10-minute walk away. St. Peter’s Cemetery, near St. Peter Stiftskeller, is where the family hid behind the tombstones. Other sites are outside the city and are usually best done on a tour. Hellbrunn Palace is where the “Sixteen Going on Seventeen” scene was filmed along with Maria and von Trapp’s kissing scene. The wedding took place in the church in Mondsee (about a half-hour drive from Salzburg) and the opening movie scenes near Wolfgangsee (about a 45minute drive). Several bus tours can take you to these sites. Other sites in the city are accessible on walking and bike tours, and even via a rickshaw tour. If this doesn’t provide a large enough fix of Sound-of-Music nostalgia, consider attending the “The Sound of Music Gala” on October 17, 2015 at Salzburg’s Felsenreitschule – that’s where the Trapp Family performed its farewell song and Baron von Trapp sang Edelweiss. My wife and I visited Salzburg a couple of summers ago when we were spending a month traveling around Germany on a German Rail Pass we bought through Rick Steves’ company. Since Salzburg is practically on the German border, you can ride free to Salzburg and back from Germany, as long as you ride on one of the German trains. Of course, it counts as a travel day on your pass, so make sure you get your money’s worth coming and going on those days. We also took the Sound of Music tour. It was corny and everybody knew it, including our tour guide. But it was great fun and everybody was singing along to the show tunes as we rode along from place to place. You always have such great stories – and good travel info! I like that tip about riding the German train to Salzburg! I live in Astoria, home to the Museum of the Moving Image that recently celebrated the 50th Birthday of the Sound of Music with a new print on a gigantic screen that made you feel like you were breathing in that edeleweiss, which I think only grows in Switzerland, but no matter this is truly a timeless piece; the scenery is incredibly vibrant and ultra sweetness it was criticized for 50 years ago is lifted by the magical music. Until 2011, The Sound of Music had never been staged in Salzburg! Really nice blog i read the full report i liked very much .